OK Pollies – time’s up. It’s the end of YOUR age of entitlement. At the time of being elected, Joe Hockey reminded us that “The age of entitlement is over“. There must be cuts, cuts and more cuts, he said. To pensioners, to health, to education, the ABC, SBS – no corner of Australia’s so-called debt and deficit disaster was to be left untouched. It turns out – there was one small but wealthy pocket of entitlement that Hockey and his buddies left untouched in their cutting frenzy. 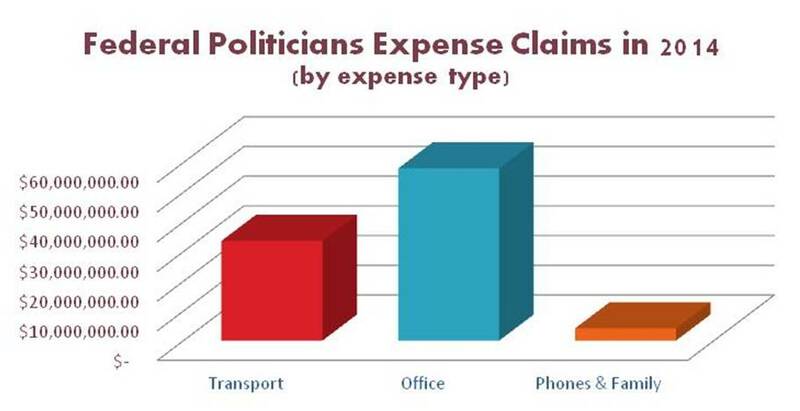 A pocket that has been getting a bit of press in the last week or so – our federal politicians’ expense claims. And if you thought Ms Bishop’s $5,000 helicopter ride was bad, hold on to your beanies and scarves, as that is just the very small tip of a very large political expenseberg. So exactly how big is the Canberra Expenseberg? In 2014, according to the Department of Finance, it was the better part of 96 million dollars. That what our federal politicians spent on expenses. And when I say expenses, I’m not talking about salaries or superannuation. I’m purely referring to their expense claims – for travel, office rental, phones, taxis etc. To break this down a little further – there are 150 members in our House of Representatives and 76 senators in the Senate. That’s 226 federal political snouts. And while there was changeover of seats during 2014 (such as when the Senate changed in July) – meaning there was actually 307 individuals who filled those 226 seats during the year – there’s only ever one politician in a seat at a time able to claim expenses. Clearly our current politicians have forgotten that they were elected to represent the Australian people, to serve us, and not to rule over us in the lap of luxury. Or perhaps they are too busy micromanaging the ABC and appointing Wind Commissioners to look into their own expense entitlements. So I have taken the liberty of appointing myself as the Canberra Expenseberg Commissioner – just temporarily – to see how much we could save if I applied a judicious knife to the Canberra political expense slush fund. I did some quick calculations on the back of an envelope this afternoon, and came up with the following cuts. No more charter flights, choppers or anything else – None. Zip. Nada. You can fly commercial, rent a car or get public transport like the rest of us. No more overseas junkets – I’m providing you all with a collective allowance of $500,000 to split amongst yourselves for trips that are absolutely necessary. Two week trips to Geneva that cost $88,084 to get yourself a sought after international posting are NOT absolutely necessary Ms Bishop. If you do have to travel internationally, you can fly premium economy and stay in four star hotels. Ministers with international portfolios get first dibs. The rest of you get what’s left. No more hire cars – that means you Jamie Briggs – no more $583 dollar rides. Each of you can have an allowance of up to $5,000 per year to get around when you’re in Canberra or otherwise away from home. Use this to rent a car with one of your political colleagues, take an Uber X or car pool with your local colleagues. We don’t care – as long as you stop wasting our money. Domestic Travel/Travel Allowance for accommodation – for some reason, according to the OpenAus website, the average Liberal minister or senator spent about $70,000 on this in 2014, whereas their Labor counterparts spent $45,000. Both amounts seem excessive, but for now I’m capping all pollies at the Labor level. Those who live further away (like WA or Tassie) can have a little more, and those that live in the ACT or NSW a little less. But if the Labor pollies can get by on an average of around $45,000 per year, you all can. Don’t get comfortable though – I may cut this further later – particularly for those of you who are using the allowance to pay off your wife’s mortgage.Oh – and no more using taxpayer funds to travel to political fundraisers, for any reason. I don’t care if you’re the speaker at the event or manning the BBQ – if the purpose of the event is to raise funds for your party, we’re not paying for it. These cuts will mean that some of you will no longer be able to travel like rockstars. But it will save us, the people who pay your salaries and your expenses, over $22 million a year – so deal with it. You spent just under $58 million on office costs in 2014. I’m cutting this in half, and here’s how…. Firstly, regarding your decorating budgets – in 2014, you collectively spent just under 6.7 million on fitting out your offices. In fact, Jacqui Lambe spent $456,793 on her offices in Burnie – that’s enough to fund the Refugee Council of Australia for three years. From now on, there’ll be less Italian custom furniture and more Swedish everyday furniture. You don’t need to redecorate every couple of years. Instead, we’ll give you an allowance of $10,000 when you first take office. And that’s it. Spend it wisely. Secondly, when it comes to your office rent and office admin, as was the case with your travel expenses, the average Liberal minister and senator pays significantly more than their Labor counterpart. So I’m cutting you all back to the amount the average Labor pollie spends. We’re not funding you to rent prime office space. We spend enough on Parliament house already. These cuts will save us, the Australian taxpayer, over 28.6 million dollars a year. Let’s start with your phone bills. You’re all like teenagers who don’t pay their own mobile bills. Have you ever heard of Skype? Or VOIP? Or Mobile Phone plans with calls included? Clearly not. Because collectively, you all spent over $2.3 million on your phone bills. Moving forward, you’ll be capped at $200 each a month for all calls. That will encourage you to go out and shop wisely for your phone providers. And as for taxpayers covering your family’s travel costs – that’s not happening anymore. If they ride in the Uber X car with you, or share a ride in Scott Ludlam’s Prius – no worries. But that’s it. These cuts will save us a further $3.6 million in total a year. And here’s what we can do if you tighten your belts…. These cuts to the Canberra Expenseberg will save the Australian people over $53 million a year. Simply by cutting back on luxuries – like riding by chopper from Melbourne to Geelong – we, the Australian people, could get back some of the things you’ve taken away from us since the Libs came into government. Yep. With the saving we make from you pollies learning to love economy class and shopping at Ikea, we could completely restore the funding you slashed from our national broadcaster, and still have money left over for some of the smaller programmes I mention below. Restore funding to the CSIRO at $29 million a year. The funding cuts you made slashed the jobs of between one in five and one in ten CSIRO scientists. That’s not on. We want them back. They add much more value to us than any hand-embroidered cushions in Jacqui Lambe’s new office fit-out. Give us back the Office of the Australian Information Commissioner at $2.55 million a year – these guys used to process our Freedom of Information requests. And quite clearly we need information about what you are doing. Making it harder for us to do this is not a good thing. Reinstate the Climate Commission at $1.25 million a year – we’ve all been funding it since you cut it, but it’s really your responsibility. And it’s about time you did something practical about global warming. Continue funding the Custody Notification Service at only $0.526 million a year – it’s a bargain. And it literally saves Aboriginal lives. Cutting it so that you can all take hire cars is not on. Commence funding the Human Rights Education programme at $0.45 million a year – we are in sore need of more information on this topic. Restore the Get Reading Programme at $1.6 million a year – this dealt with child literacy. Cutting it while you kept going on your overseas junkets was not a good idea. Give the Refugee Council of Australia back their $140,000 a year – it’s small change to you. Use the balance of nearly $20 million in savings to pay back debt. I don’t care which option you choose. Either way, your age of entitlement is over Pollies. Snouts out of the trough. You are the servants of the Australian people. And we want you to spend OUR money on things that benefit US and not you. What does it take to pass a no confidence motion against this horror government? Animal Farm is alive and well it’s called the LNP government.